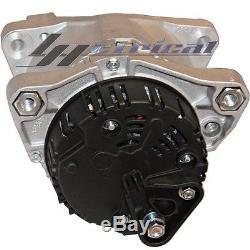 100% NEW REPLACEMENT ALTERNATOR FOR. 14 Volt, CW Rotation IR (Internal Regulator) IF (Internal Fan) Pulley Type: 6 Groove Pulley. Replaces: BMW # 12-31-1-247-288, 12-31-1-247-310 Bosch-Remfd # AL0736V Valeo # 439007, A13VI78,2541697. Features: 100% New Aftermarket Valeo Style Alternator Rectifier features 13mm press-fit diodes w/ crimp-weld diode terminations Regulator features High amp MOSFET field transistor Premium, Hi-temperature Bearings Hi-temperature class-H windings Precision CNC machined castings OE performance output curve. THIS ITEM IS 100% NEW OE REPLACEMENT, IT MEETS OR EXCEEDS OEM SPECIFICATIONS, BACKED BY. All Makes and Models, Gas or Diesel Alternators and Starters available NEW, Rebuilt. HI, AK, PR, APO/FPO or other US Territories. 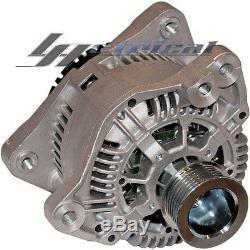 The item "100% NEW ALTERNATOR FOR BMW 318 Z3 1.8L 1.9L GENERATOR HD 80A ONE YEAR WARRANTY" is in sale since Wednesday, October 13, 2010. This item is in the category "eBay Motors\Parts & Accessories\Car & Truck Parts\Charging & Starting Systems\Alternators & Generators".